In the 70s and 80s, Georges Martin was one of Europe’s most prolific frame and component manufacturers. Based in Les Sables-d’Olonne, a picturesque seaside town in western France, he built almost 6,000 frames for custom and racing motorcycles. 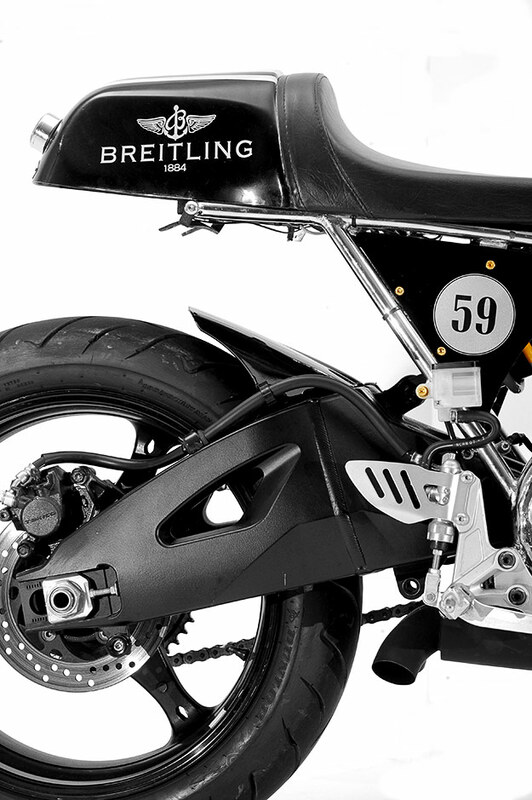 He’s still an iconic figure on the continental scene, and this new café racer is a tribute to his skills. 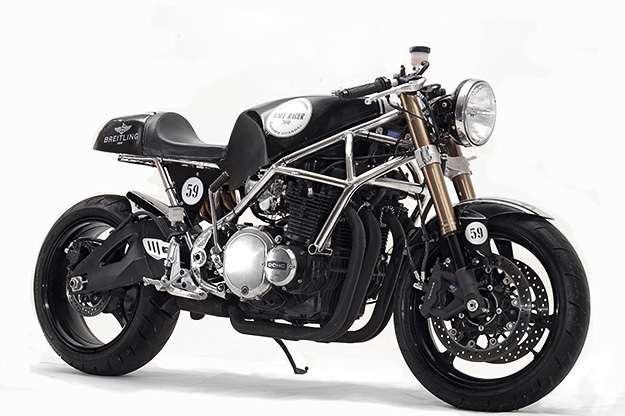 It was built by Alain Bernard of Santiago Chopper to rekindle his old passions of racing motorcycles and Kawasaki in particular. The frame is an original 70s Martin frame; Moto Martin bikes were usually powered by uprated Kawasaki, Honda or Suzuki engines, so Bernard has chosen a Kawasaki Z1000 motor. The front end, swingarm and 17” wheels are from a 2007 Suzuki GSX-R, while the seat is a Benelli item. 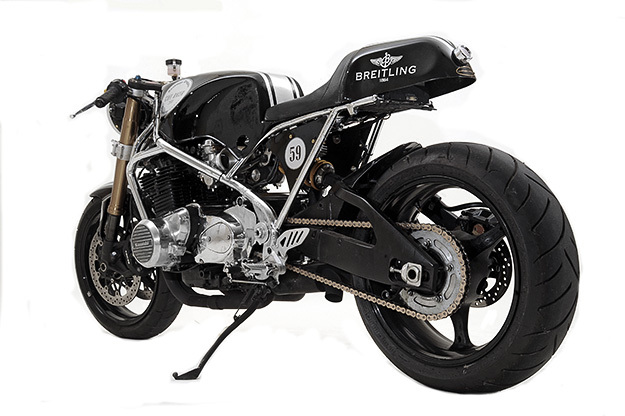 The bike replicates the squared-off, chunky look of an original Martin tank, but the Breitling-themed paint is a distinctly modern touch—Bernard has built a motorcycle in the past for the owner of the Swiss watchmaker brand. 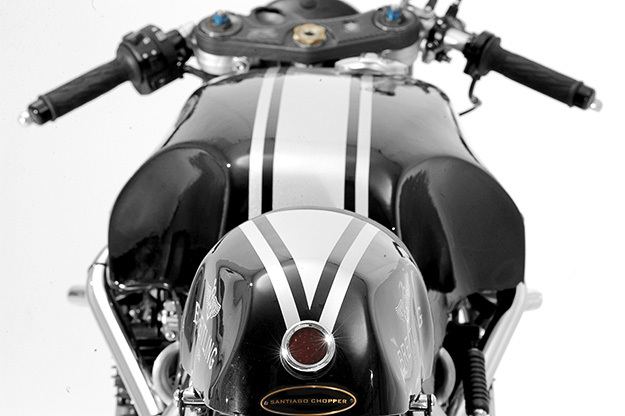 Look out for this cafe racer on Discovery Channel in October, and it will be sold at auction to raise money for the charity Curing Kids’ Cancer. With thanks to Erick Runyon. Photographer’s note: These images were shot with a Nikon D3, with 700-200 F2.8VR and 27-80 F2.8 lenses. The shots were lit with the Nikon CLS lighting system, consisting of one SU800, two SB800s and four SB600s. No Pocket Wizards or Radio Poppers were used during the shoot.